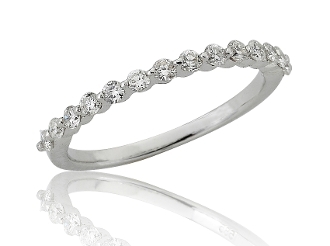 This classic stackable eternity ring features a dazzling 0.38 Carat t.w. of handpicked brilliant round cut Diamond Solitaires, exquisitely prong set, in glamorous 14 Karat white gold. With a dazzling lineup featuring 14 shimmering Diamonds set across the top of the sleek stylish band. This is a ring of sophistication that symbolizes years of love. Can be worn individually or stacked alongside other bands for a more fashion forward look. For added appeal personalize your item, select our Engrave option and indicate size needed when adding to Cart. For an even more fashion-forward look select multiple rings in white, yellow, or rose gold.